In 1937, European Jewish immigration due to Nazi power in Germany, increased the Jewish population in Tel Aviv to 130,000. After the war, the numbers dropped to about 30,000 by 1945. 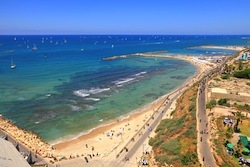 Population of the Jewish community in Tel Aviv today is estimated near 2.6 million. This unique Jewish Penicillin recipe from Tel Aviv packs parsnip, Italian parsley and fresh thyme. The addition of Matzo balls allows the chicken soup to be served as a hearty dinner. Jewish Penicillin is safe for protecting women from cold in pregnancy. Turn heat to medium and steep – never boiling. When the water is just about to boil, quickly move heat to low and cover. Simmer soup on low heat for 4 hours – a crock pot could be used for this step. Turn off heat and remove chicken and vegetables and toss in garbage.Add salt to taste and strain if desired. Melt 1 tb butter in skillet over medium heat. Scramble eggs adding salt, ginger, pepper, garlic and parsley along the way. Variations: Chicken can be boned and added back into this Jewish Penicillin recipe for a heartier dish. Some versions include peas, carrots and vermicelli. These additions to the Jewish Penicillin recipe should be cooked in a separate pot before adding to soup to retain texture. Matzo balls can be cooked in soup broth before serving.